Chuck Panozzo was a high school art teacher when he, his brother and some friends started a band on Chicago's south side in the early 70's. While they gained a good local following and had put out a couple of albums, they hadn't been able to break into the national scene until 1974. That's when Chicago's powerhouse FM station WLS played a song from their second album. The song was "Lady" and the band was Styx! In the 70's and 80's Styx became one of the top rock acts in the world with singles such as "Come Sail Away," "Blue Collar Man," "Renegade," "Fooling Yourself" and "Too Much Time On My Hands" and albums that reached at least platinum certification. Styx also put its mark on rock history when it became the first band to release 4-consecutive triple platinum-albums. Being the bands bassist, collaborating with the writing of the songs and even overseeing the album artwork kept him consumed in his work. "Being so involved in music had become my way of living with the secret I had kept from most. I had told my brother and sister when I was 20 that I was gay," Chuck said. While Chuck's sexual life was never a topic amongst the band or his family, mostly due to the band's huge success, he couldn't come out publicly. If Chuck would have come out back then, he felt he would have had to quit the band. Chuck said, "I couldn't have risked being the possible reason for the band to fail by announcing I was gay." In 1991, Chuck went to a local clinic for a cough and cold and they asked him if he'd like an HIV test and he said, "Why not?" The test returned positive. "I really wasn't surprised. I was infected just by being a part of the community at the time. I wasn't really devastated either. In the late 80's, I had become a professional pallbearer. I just hoped research would catch up with the progression of the disease." Chuck had been seeing family practice doctors when in 1998 he became sick and began to go to a clinic in Chicago with HIV specialists. He decided that he was going to set goals to get better and to play again. He left the band for 2-years and went on an aggressive regimen of 30-pills-a-day. "At first, for 2-years, I couldn't get off the couch. I had a bad time with the side effects," Chuck said. "I was able to make adjustments to my life and my viral load went down and my T-cell count was up. After the 2-years of hard work, I was undetectable. Now I was onto my second goal of playing again." 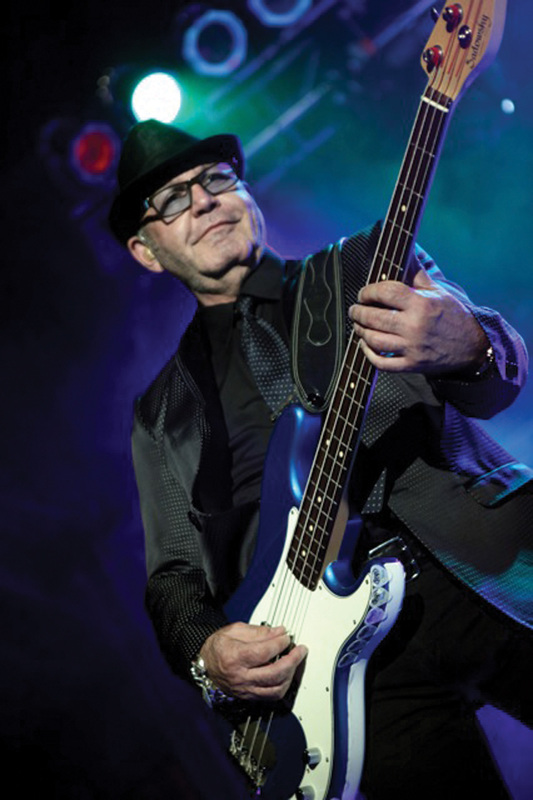 Chuck made his return to Styx premiering in Las Vegas and completing a 40-city tour in 2001. Chuck said, "My band members became one of my support groups. They saw me sick and they saw me healthy." After accomplishing his goals to get healthy and to start playing again, Chuck made the life-changing decision to out himself. "The more honest you are...the happier you"ll be. You have to tell the truth about yourself" Chuck said. Being used to the grand stage, Chuck chose a speaking engagement he had at McCormick Place in Chicago for the Human Rights Campaign (HRC), an organization he had become involved with, to go public about being gay and HIV positive. "It was the right time for me. My family and friends were there - my aunt, uncle, sister and band member James Young were all there for support, it was a freeing day for me" Chuck said. Now Chuck doesn't miss the chance to get the message out not only about gay rights but the rights of people living with HIV. "I was a teacher and I know that education means everything. I'll play for 500,000 people this year. Being a musician has given me a platform. Some people ask me "why do you keep talking about this?" I tell them for the same reason McDonalds advertises...so it's out there." Chuck has much of the same advice that many of our past Positive Profiles have had for people living with HIV whether they're newly diagnosed or treatment experienced. Chuck says,"Don't be reclusive. Join groups, see psychologists if you need to and don't play the shame-blame-game. Live life the way you want to and don't let others define you." These days Chuck is still hard at work. He has the luxury to take a break from the Styx tour every now and then but chances are you can catch him at one of their 107 concerts this summer whether it's a solo Styx performance or playing with REO, Ted Nugent or Blue Oyster Cult. Chuck was also named to the list of top-10 gay musicians, right on the list with Elton John and Freddie Mercury. "I'm happy working. I'll quit when I cannot fit into my Rock and Roll jeans anymore. The evolution of my acceptance as a gay rock band member is amazing. I'm able to bring my partner out to appearances and I'm able to stand shoulder-to-shoulder with Rock and Roll's best today." When he's not playing Chuck donates his time and an occasional guitar to several organizations and causes. He also has published a book titled "The Grand Illusion: Love, Lies and My Life with Styx" that can be found on Amazon and in book stores. To Catch Up With Chuck: You can find out more about Chuck Panozzo by going to either www.chuckpanozzo.com or www.chuckpanozzosplace.com Make sure to sign the guestbook and he'll get back with you in person. If you would like to see him live, in concert this Summer and Fall. Log on to www.styxworld.com. The site has all of the current concert dates and other information about Styx. Copyright 2013, Positive Health Publications, Inc.